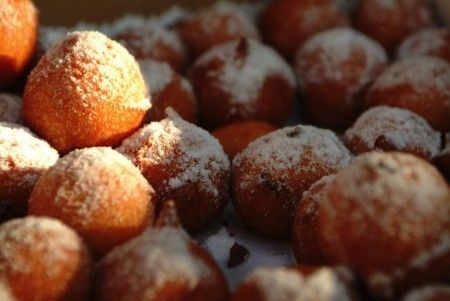 Fritole are Italian doughnuts, traditional to the Northern part of Italy. They are made in Venice during Carnivale and in other parts they are made for Christmas. My Mum has always made them for New Years and I have always wanted to know how to make them. We dug up a recipe that resembled something similar to how Mum makes it. I haven't had a chance to make the Fritole yet, but I wanted to share the recipe with you all so you can give it a go. In a mixing bowl mix the eggs and the sugar together, add the cinnamon and the lemon zest to this. Slowly add some of the flour and then add some of the milk. Do this in batches until you get the consistency of dense cream, you can add more or less of each. Add the raisins (and if using yeast let it rise for about 1 hour). Note: Mum also added a few tablespoons of the canola oil into the batter once all the ingredients are combined. Supposedly it stops more oil than necessary absorbing into the doughnuts when frying. Add a spoon full of the batter into the oil so they resemble small doughnuts (as in the picture above). When they are cooked, they should flip over by themselves and start cooking the other side. If this does not happen, you can flip them over yourself. Do this in batches and remove the Fritole out of the oil when they are golden brown. Cool down on paper towels. Add the icing sugar to the Fritole. Oh, they look super but very decadent. Have a great week. Oooh! This looks good. Although I do have a slight fear of deep frying. You're very clever. They look so delicious.